The two units combine for 3 bedrooms (+ small “bonus room”), 2 full baths, 2 half baths, 1.5 kitchens & 2 living rooms, each w/ sleeper sofa. Each unit boasts an open floorplan, remarkable ocean views from nearly every room, and high-quality beds and linens. 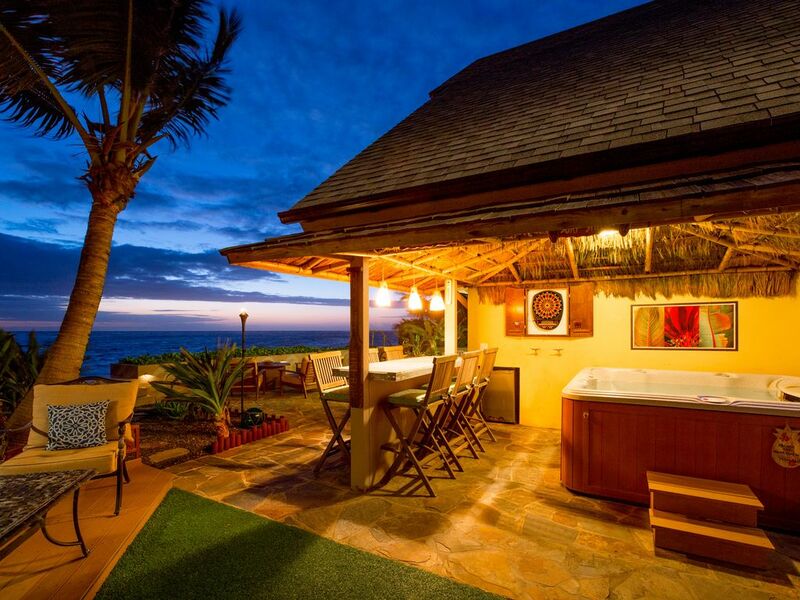 Beachside outdoor space includes a large slate terrace, thatched-roof tiki bar, 7-person hot tub, shower featuring hot water, 2 BBQs (propane provided), 2 lounge sets & 3 chaise lounges. Sandy beach is perfect year-round for swimming (no rocks & minimal swell exposure), while the nearby reef - flourishing with huge green sea turtles - is great for exploring by kayak or snorkel. Notable amenities: 7 TVs, 3 DVD players, WiFi, A/C in bedrooms, washer/dryer, 2 kayaks, boogie boards, snorkel gear, beach toys, beach towels, coolers, ice makers, extra linens, guide books/maps, board games, dartboard, 2 parking spaces. english, Google Translate used for all other languages. toilet, combination tub/shower, jetted tub, Ceramic-tiled Jacuzzi tub! toilet, Attached to master bedroom. Split toilet/vanity areas. outdoor shower, Common use, with hot water (rare)! The location was great. It was close enough to everything but in a small town. There was a storm before our arrival that cluttered the beach at the house with large logs and debris so we werent able to use the beach at all, but we enjoyed the sight and soundof the beach. There are several beaches near by we swam at. The house was everything we needed it to be. Thanks! Thank you for opening up your beautiful, comfortable home to us. We had seven adults, we rented both units and the stay was comfortable. The beds were good quality and I slept like a baby. The airconditioning in the bedrooms was welcomed! The local roosters provided us with morning wake up calls! The downstairs dining area was wonderful and open. We did prepare a full Thanksgiving meal and the stove and stovetop did give us some trouble and needs to be replaced due to the corrosion of the sea air. We did manage and all was wonderful. We thoroughly enjoyed the outdoor space and the "toys". The jacuzzi was fantastic and the warm outside shower is a great treat. The parking space is sufficient but as you mentioned in your paper it is very dangerous getting in and out of the parking area due to the highway. The curb appeal might be improved by removing the old car in the driveway. We enjoyed the location close to the Polynesian Cultular Center and the North Shore. If we find ourselves back on Oahu I would love to stay there again! We did have a few questions and all were answered promptly. Wonderful relaxing place! Good value for families that want a little space. I stayed here with extended family in the bottom and top locations and we had a great stay. The place was clean and comfortable with an amazing view of the ocean to see right from a beautiful lanai. Jessica was prompt in addressing any concerns we had about questions prior to and during our stay. It is off of a main road, but you didn't hear the traffic noise. I would recommend this place to anyone. My family and I enjoyed staying at your place very much. It had everything you could ask for.Thank you very much Shawn and Jessica for sharing your wonderful house. Hau'ula and the surrounding area is often likened to 'old Hawaii,' still representing what Hawaii once was. Instead of large malls and chain restaurants (i.e. Waikiki), the area has family-owned gift shops, unique little restaurants, and a pace of life that many envision when planning their Hawaii trips. Highlights of the area: (1) five minute drive to the Polynesian Cultural Center, Hawaii's #1 tourist attraction (2) many great hikes (some with waterfalls) in the mountains seen in our aerial pictures (3) lush green foliage and mountainsides, drawing comparisons with Maui (4) good, local people offering a glimpse into 'true' Hawaii living: a truly authentic Hawaiian experience (5) twelve minute drive to Turtle Bay Resort, and their golf courses, restaurants, bars, massages, helicopter rides, etc. (6) minutes to good surfing spots, and only about 20 minutes to famous big-wave spots like Pipeline and Sunset Beach (7) quiet, tranquil, peaceful...the best way to describe Hau'ula!